Both saltwater pools and traditional chlorine types have awesome features. If you’re on the fence, you certainly aren’t alone. Which features suit you best? Read on! The biggest myth surrounding saltwater pools is that they contain zero chlorine because the water comes from the sea. But the truth may surprise you. Saltwater pools don’t even come close to seawater. In fact, they aren’t even chlorine-free. Saltwater pools use a process called “electrolysis” to produce just enough chlorine to disinfect the water. Lower chlorine levels make saltwater pools gentler on skin and eyes. This is a great choice if the pool is to be used by young children and athletes who are immersed for long periods of time. A saltwater pool is more expensive than a traditional pool because it requires a higher initial investment. Compared to chlorinated pools, a saltwater pools system is more complex. Both minor and major repairs will call for the expertise of a licensed (and specialized) technician. Saltwater can damage. You will need to purchase underwater lighting, heaters, fixtures, liners, and masonry work specific to saltwater pools. 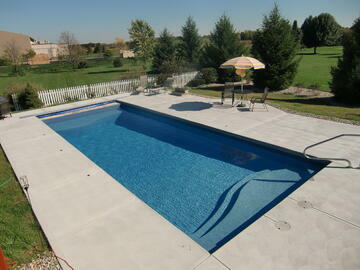 Which will end up being more costly when doing pool renovations. Chlorine pools are popular because it’s cheaper to install and easier to maintain. Unlike its saltwater counterpart, chlorine is added rather than naturally produced. Chlorine pools use less electricity. Saltwater pools require a special salt chlorine generator to convert salt into chlorine. Chlorine pools, on the other hand, merely require a pump (to circulate the water in your pool, which prevents dirt, bacteria, and algae from multiplying in the water), and cleaning equipment. Most repairs can be done DIY (do-it-yourself). Otherwise, finding someone to fix a chlorine pools systems won’t be a problem. Chlorine is known to be harsh on the skin, eyes, and hair. Swimmers should invest in bath products that effectively remove chlorine. Can also be very harmful to any pool decking if you didn’t choose the correct paint. Chlorine pools require constant vigilance to kill excess bacteria. This means that you need to check on chlorine content on a regular basis. In addition, other chemicals such as balancing agents, need to be added consistently. Bottom line: you need to up your budget to maintain a chlorine pool, and have someone habitually check on your pool’s chemical composition. Chlorine has to be stored properly. You may have to dedicate an exclusive area free from moisture to keep components active. The “old-school” chlorine pool has been around for more than five decades, which makes the 30-ish saltwater pools much younger in years. The choice, however, is never obvious. Chlorine pools need more commitment while saltwater pools require deeper pockets up front. Many public establishments such as water parks and hotels have begun to convert to saltwater pools simply because they require less manpower and are less expensive to keep clean. But a good number still stand by their chlorine pools for its fixture-friendly features.